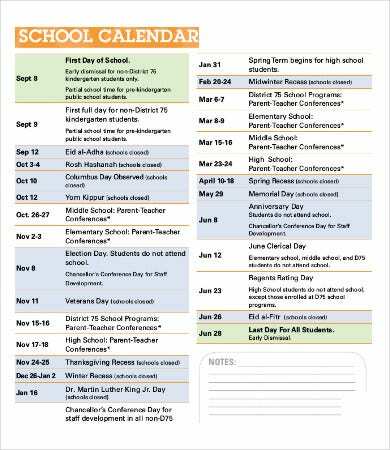 Students who meticulously plan their schedules ahead of time are arguably more likely to achieve success in their academic and extracurricular endeavors. 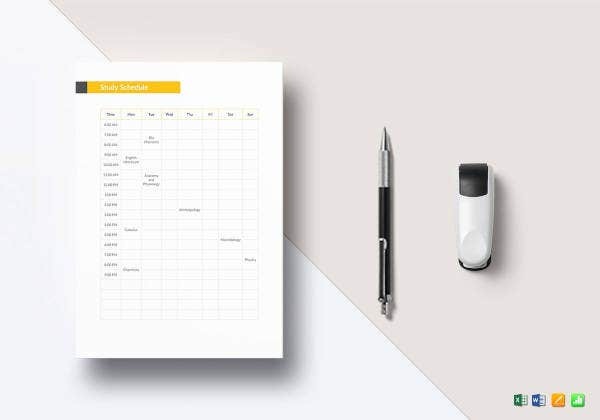 Writing down the schedule of exams, assignment deadlines, extracurricular activities, student conferences, and group study meetings is an effective time-management strategy. If you are the straight-A, student body–leader type burdened with countless responsibilities from your numerous school organizations, we have the perfect tools for you! 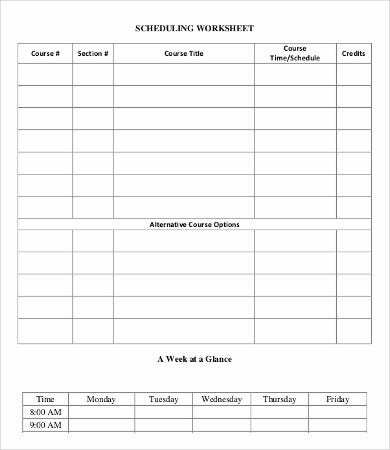 We also have 10 varying student schedule template samples for the elementary, high school, and working students are available for download. 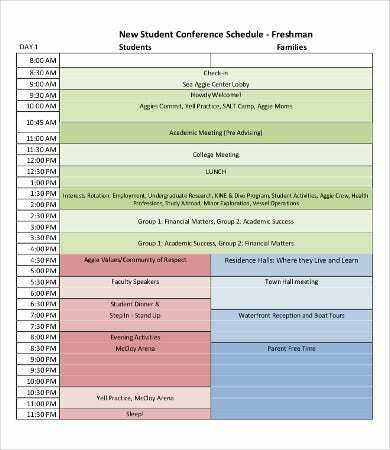 These templates help you cruise student life with great ease. 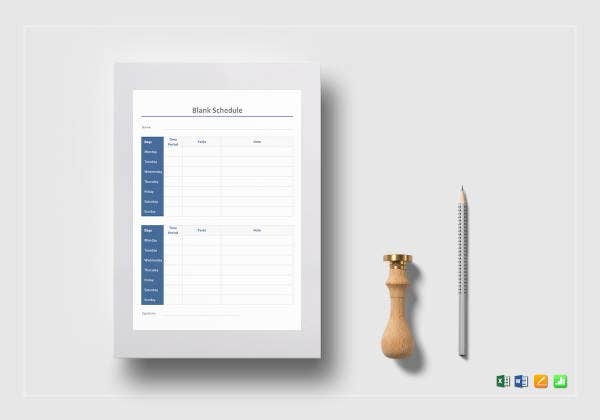 In planning, just like everything else, it is of paramount importance that you choose a schedule template that suits you best. 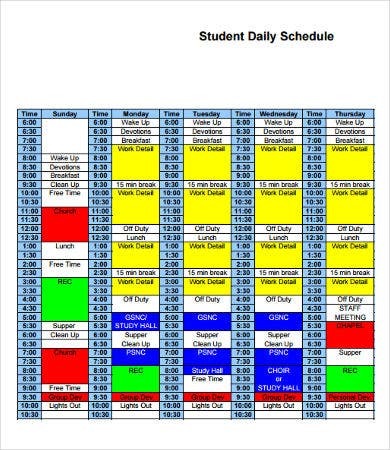 Students who work better by micromanaging their time would find the Daily Schedule templates useful. 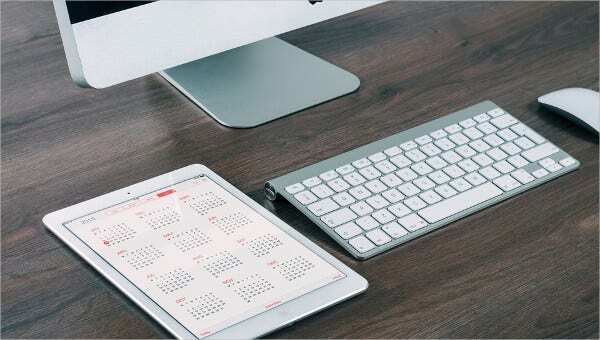 This template allows you to specify the amount of time you plan on spending on a specific task. You can even plan daily routine activities such as waking up, cooking breakfast, and taking a bath. 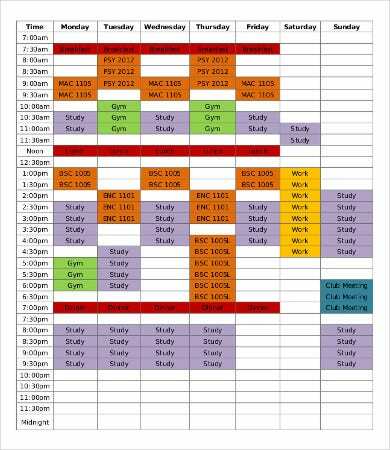 For those who prefer a quick overview of their pending appointments and important assignment deadlines at one glance would find the assignment and weekly schedule template more useful. 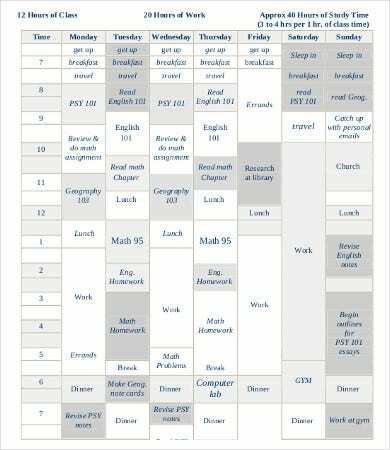 Idiosyncratic planners can also benefit by downloading the Blank Schedule and student class schedule template, which are easier to edit. 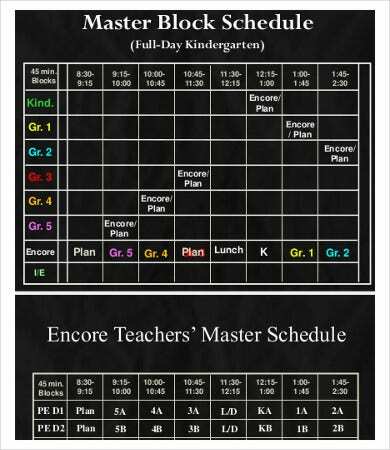 Of course, we also have in mind the planning needs of elementary and high school students with templates that are more basic in form. Younger students would find these templates’ lack of complexity appealing. University students taking up their undergraduate or postgraduate courses would find the higher rungs of the academe rife with competition and demanding assignments. 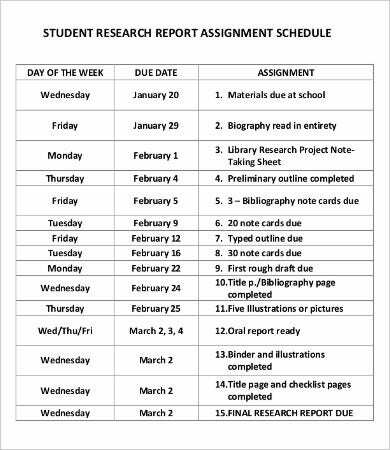 As can be seen below, the study schedule planner is perfect when the deadline and cramming season comes knocking at your door! Humans are more effective when there’s a combination of visual and kinesthetic involvement. Writing down your plans requires you to activate your psychomotor skills by moving your hand. Meanwhile, you are better able to process these plans by viewing it as you are writing those down. 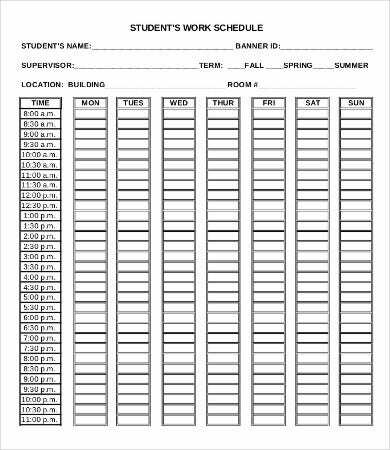 That is why it is advantageous for students to utilize our student schedule templates. It improves your ability to store information. This is so because when you write down your plans, your working memory is emptied. In turn, its capacity is maximized and you can now focus more on the task you are doing at the moment. Long-term planning is made possible. By virtue of logic, when your working memory is free from trying to remember plans, you can perceive a clearer vision of your long-term goals in the context of your present reality and capacities. It enables students to live a more holistic and well-rounded life. 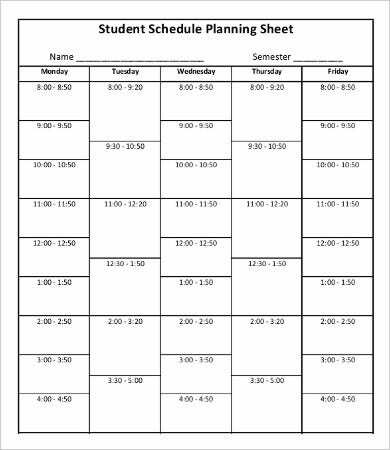 Plotting down your Study Schedule allows you to determine the appropriate time slots for non-academic activities. Recreational activities enable you to unwind, and consequently, you become more effective in completing your academic tasks.